With Valentine’s Day just around the corner, it’s time to search for the best gift that’s sure to put a smile on his face. Check out our list of incredible Valentine’s Day gift ideas, filled with presents any man is going to love all year round. You are welcome in advance! There is nothing like a good phone case to keep his phone and cards safe and secure. We recommend Snakehive for fine quality leather wallet phone cases and accesories to gift your man this Valentine’s Day. London is freezing cold at the moment, so a weekend getaway this Valentines might be a good idea for you and your man. Any reason to get him to rock this irrestible beach shorts by Bluemint, featuring a regular fit, front and back pockets, soft quick-dry fabric and they have an array of outstanding prints to choose from and even customisation options. For timeless beachwear for him, look no further than Bluemint’s patterned shorts. 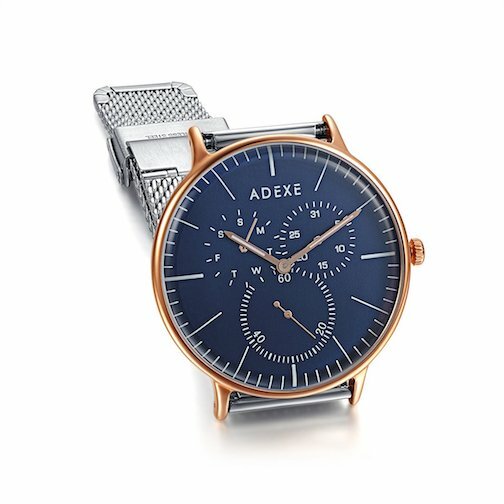 If a weekend getaway to Paris is too much of a stretch, then this Adexe grande timepiece is the next best thing. This bestseller features a masculine elegance with great functionality at an affordable price tag. They also come with a pair of extra straps and perfect for everyday wear. Rum is always a good idea. So Glasgow brings us this Wester Premium Spiced Rum Spirit Drink, boasting with exceptional spices as well as citrus and vanilla. The name comes from the Wester Sugar House Company, dating back to 1667, a power house treasured in Glagow, refining sugar and also distilling rum. Now, this is sure to be a treat to end a lovely Valentine’s night.